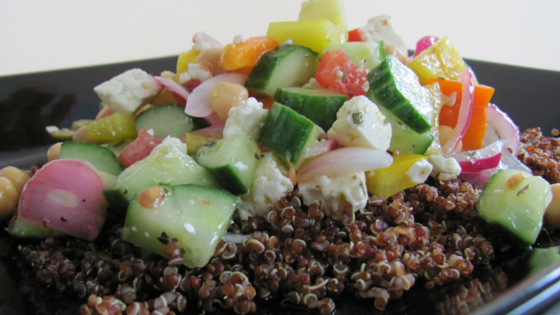 Contagiously Positive » No More Boring Salads! In my house, we don’t make boring salads. When I don’t want to make an entire meal, I make big bowl salads that are not only loaded with essential nutrients, but keep me full and prevent me from snacking later on in the evening. 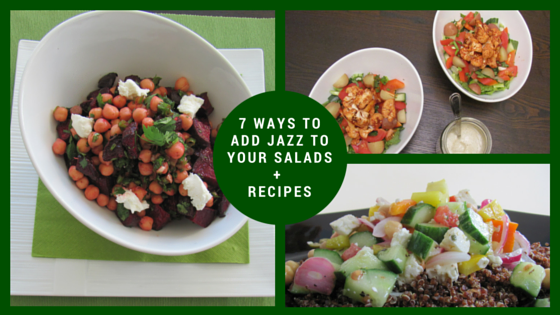 Here are 7 tips + 3 recipes from Healthy Living to help you make a salad that will not only be healthy, but will satisfy your cravings. 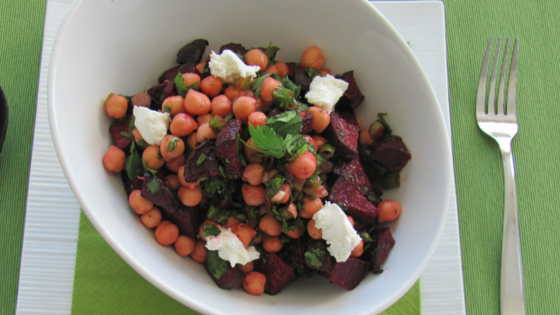 Load it up with a mix of roasted beets and sweet potatoes. Naturally sweet tasting vegetables like beets and sweet potato will help prevent sugar cravings. If you are always craving sugar, give yourself a healthy dose from naturally sweet tasting food and you will start to not crave refined sugar. This tip has helped many of my sugar addict clients. Beets and sweet potatoes are also an amazing source of healthy carbohydrates that provide fuel for your brain. Happy carbs! You need complex carbohydrates for a healthy mind & body, so adding a dose to your salad is a great way to add some healthy bulk. You can also add beans and legumes. Load your salad with lots of colour. The variety of colorful vegetables gives you a ride range of vitamins, antioxidants, and minerals. The more colourful, the better. Not to mention it looks prettier. If you want to add cheese, shred it instead of using chunks of cheese. By shredding it, you are using a lot less which will prevent you from eating too much and keeping your intake of calories and saturated fat down. You don’t need any more than a couple heaping tablespoons to satisfy your cheese craving. If you want to add meat, use a lean organic meat like chicken, turkey or fish. Keep the portion to the size of a deck of cards. That is a great rule of thumb to follow when eating meat. Meat isn’t bad for you, it provides you with a healthy amount of protein, but too much animal protein can cause weight gain and inflammation in the body. Eat meat, just don’t make it the main event. By adding a balance of fiber, protein and carbohydrates, it will provide you with long-lasting energy and keep you feeling fuller longer.This means no late night snacking and unwanted cravings. When choosing your dressing, I recommend making it yourself with extra-virgin olive oil and avoiding cream dressings. If you do want something creamy, make it with plain yogurt. Bottled salad dressings are often loaded with sugar, refined salt, and unhealthy fat. There are healthier options available, just read the labels. However, making your own is easy and will keep the cost of your grocery bill down. There are lots of easy recipes in the recipe section of our blog. 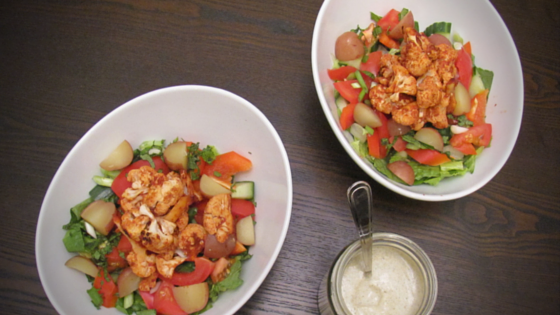 Here are three of my favourite loaded salads from the Contagiously Positive Kitchen.